The book that Defense Secretary James Mattis recommends as America faces the threat of conflict with North Korea. In a recent story, Newsweek reported: “Amid increasingly deteriorating relations between the U.S. and North Korea, as President Donald Trump and Kim Jong Un exchange barbs and the threat of a nuclear conflict looms, Mattis responded to a question on how best to avoid such a war. 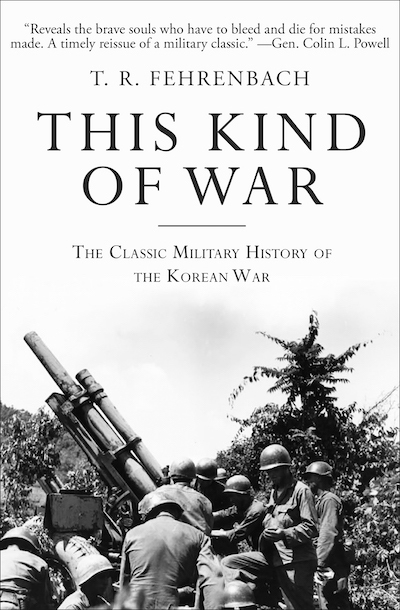 This Kind of War is “perhaps the best book ever written on the Korean War” (John McCain, The Wall Street Journal), the most comprehensive single-volume history of the conflict that began in 1950 and is still affecting US foreign policy. Fifty years later, not only does this enlightening account give details of the tactics, infantrymen, and equipment, it also chronicles the story of military and political unpreparedness that led to a profligate loss of American lives in Korea. T. R. Fehrenbach, an officer in the conflict, provides us with accounts of the combat situation that could only have been written by an eyewitness in the thick of the action. But what truly sets this book apart from other military memoirs is the piercing analysis of the global political maneuverings behind the brutal ground warfare that marked this bloody period of history, one that has been all but forgotten by many, but has become crucially important again.